Good in good dust jacket. Small tears and stains to the dust jacket. There are some pages with some sentences highlighted. Text fully legible. Good condition is defined as: a copy that has been read but remains in clean condition. All of the pages are intact and the cover is intact and the spine may show signs of wear. The book may have minor markings which are not specifically mentioned. Most items will be dispatched the same or the next working day. Fair. 0785213066 Ships from Tennessee, usually the same or next day. Very Good. 0785213066 Ships from Tennessee, usually the same or next day. This is a story within a "real" story and interestingly enough, about "story". Humorous and down to earth, this writer challenges us to live a life that makes up proud of our story. This book was truly an inspiring book. Loosely spiritual, it involves God, but also how we can "make a better story". I recommended it to my church's Women's Book club, Highly recommended. Specialized audience of folk seeking new breath into thieir faith. Some of that group will be familiar with some of his other writing. This book has a curious twist using a couple of non-faith movie makers as the speakers of some of the subtle truths. Worth the read if you are looking to grow -- will be boring otherwise. 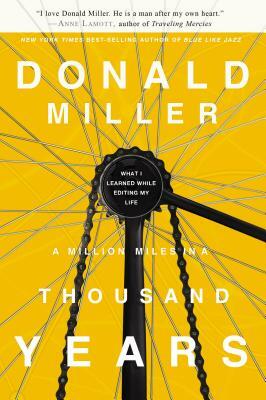 In Donald Miller?s A Million Miles in a Thousand Years: What I Learned While Editing My Life you will certainly find honesty if nothing else. It my policy to only promote edifying christian books. And although the book did herald the goodness and mercy of God and did encourage the reader to a better life, I cannot recommend this book as it does contain very inappropriate references. As a book reviewer for Thomas Nelson, I am required to review this book. It is my personal policy, however, to NOT disparage a writer or publisher. It is for this reason, I do not post reviews that discourage a reader to choose a book. Readers are certainly able to decide for themselves based on other reviewers posts whether they should read this book or not.